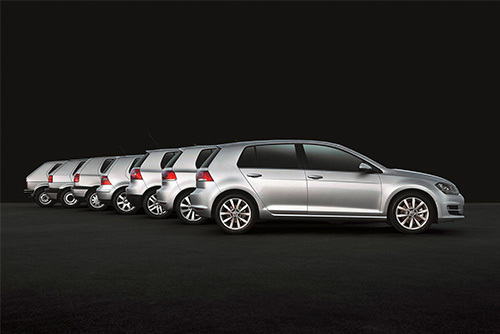 This week the Volkswagen Golf is celebrating it’s 40th birthday. The most successful European car of all time, more than 30 million Golf’s have been sold and from the first generation in 1974 to the seventh generation today. The first series production Golf rolled off the assembly line in Wolfsburg on 29 March 1974. As the successor to the legendary Beetle, of which over 21.5 million units were built, the Golf Mk I had an extremely tough act to follow, replacing what was then the World’s most successful car. Designed by Giorgio Giugiaro and Volkswagen Design, the Golf moved away from the Beetle’s rear engined, rear-wheel drive layout, replacing it with a transversely mounted front engine and front-wheel drive. It was a gamble but it worked. By October 1976 the one-millionth Golf had been produced and the front-wheel drive/front-engine transverse layout has pretty much been the the template for every hatchback ever since. The Golf success continued with the first Golf GTI (in 1976), which brought both dynamics and real desirability to the hatchback class. With the Golf Cabriolet, introduced in 1979, Volkswagen launched an open-top car that was regularly the best-selling cabrio in the world. The hatchback class has evolved almost beyond recognition in the past 40 years. Modern cars are often criticised for growing larger, heavier and more technical than their predecessors (if you were being unkind, you might say they’d benefit from liposuction – also invented in 1974) but with features like Adaptive cruise control, City Emergency braking, LED headlights, hybrid-drive, ABS, Air-bags (the list goes on and on) features common on Golf’s today, modern hatchbacks have also become more refined, economical and much safer. Over the last 40 years the Volkswagen Golf has played an important role in bringing these features and technology to the mainstream. Answering the critics, the Golf Mk VII (launched in 2012) was both lighter and more economical than the car it replaced. 40 years and over 30 million Golf’s later. The Golf is the most successful Volkswagen ever. Happy Birthday Volkswagen Golf (don’t eat too much cake! You’re middle-aged now and have to watch your cholesterol).